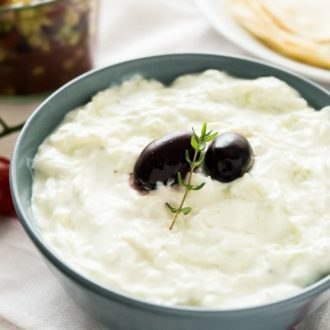 Easy authentic Tzatziki Sauce Recipe - this greek yogurt cucumber dip tastes great with grilled meat or fish and is so easy to make at home. You only need a few simple ingredients to make this famous and refreshing Greek condiment. Grate the cucumber coarsely, sprinkle with salt, mix, and drain through a fine mesh sieve for about 30 minutes. Use a spoon to squeeze out some more liquid. Combine the greek yogurt, grated cucumber, minced garlic, olive oil, and white vinegar in a large bowl. Season with salt and pepper. Add a little bit of dill if you like it.